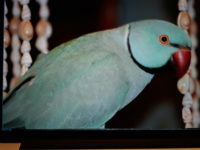 Azule is a talkative, Indian ringneck Male, blue with a black ring around his neck. He is very friendly and may fly down to you for help. He is likely thirsty and hungry. Please help him if you see him and contact us immediately 561-860-1556. He is our beloved pet of 8 years and even talks like me. He likes to sing zippity do da.